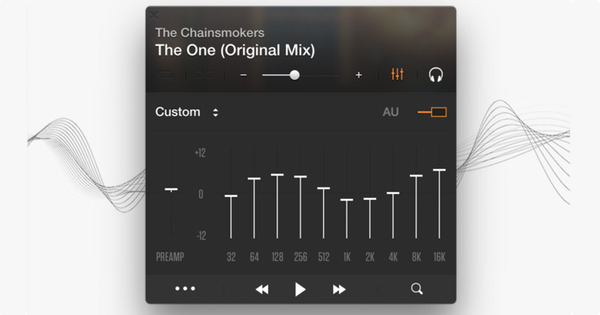 What is the Equalizer in VOX and how to use it? The ugly truth: everybody knows what an equalizer is, but nobody knows how to use it. Most decent audio players include different variations of equalizers, starting with some primitive ones concluding with too elaborate and confusing ones. 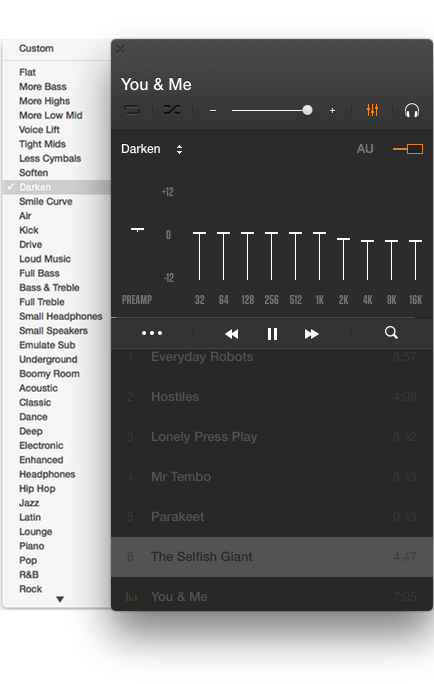 The equalizer in VOX Music Player for Mac offers a 10-grid equalizer with an enhanced algorithm for frequency adjustments for Mac users. Before we go into details, let's answer a simple question. Why do we need an equalizer? 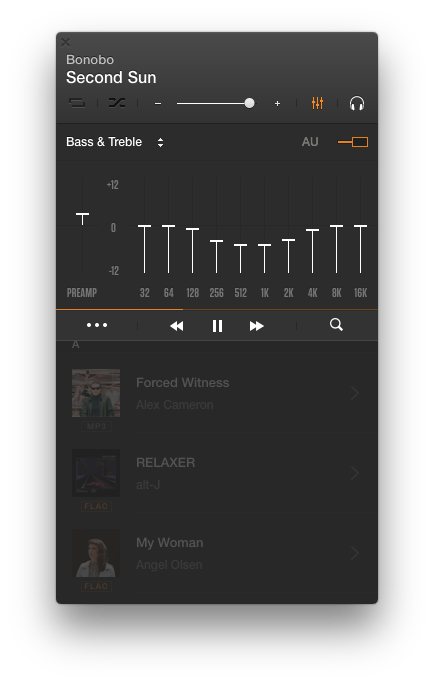 Adjust the frequency components of music material to desired balance – not all recordings are of the same frequency balance, and they can’t be so because music is creativity. Sometimes we may want to adjust frequency balance for better listening experience. Compensate for changing acoustical background noise (in the subway, in a car, in crowded places) to avoid the need to increase the total volume. Timbre perception depends greatly on the loudness. If you listen at a low volume, you might want to raise low and high frequencies. When you are listening to it loud, you will probably benefit from reducing the hi-mid region as most sensitive. You can use Apple Audio Units as a creative tool in a party/DJ situations. How is VOX Equalizer different? In each band, you can control gain (more/less volume) and frequency (where/what to adjust). This gives you the absolute control over the sound. Instead of displaying ten sliders in a row to move up/down VOX provides the ability to raise/lower any frequency by moving it in both dimensions. And it’s not in 1-octave steps in frequency like in 10-band EQ but also anywhere in between. Flexibly, continuously, just by moving finger over the screen, you can change the sound in real time. And smoothness of curves is guaranteed by the fact that bands are relatively wide. Unexperienced users sometimes think it's better not to interfere with the recorded sound not to spoil the original recording but listen to what artists wanted to share with us. However, the equalizer is not about ruining but highlighting vital senses. Equalizer should be gentle to the music, the effect should be noticeable just as much as required. Large choice of presets gives you the ability to quickly find the sound you would enjoy without sliding frequencies most of the time. Keep in mind that VOX presets' names are only for identification, they don’t always reflect what they are for (“Rock” isn't necessarily for rock music, “Deep” will be deep on some track, on some - not). Boomy Room - for rooms that have this inherent acoustical low-frequency ringing. Before using the equalizer, you need to enable it – use the switch at the right top of the EQ pane. The equalizer consists of ten vertical sliders each corresponding to a designated frequency, displayed at the top of every slider. The middle slider position (zero or null dB) means that no signal processing is applied at a frequency – neither addition nor reduction. Moving slider above zero position increases the level at a given frequency, and moving slider below zero reduces it. The sad part is, when you slide the frequency up above zero you will most likely create some noticeable distortion of the sound. It happens because nowadays music is usually recorded at max loudness, and if you try to raise it, it usually results in the sound overflow hence, distortion. To compensate for gain changes caused by boosting or cutting frequencies in the equalizer, use the gain slider at the left side. If you raise up 100Hz at 6 dB, lowering gain to corresponding 6 dB will ensure that no distortion will occur. Yes, this will result in a volume drop, but you will get a distortion-free equalization. You can later add volume using device volume controls. Doesn't sound that easy? Well, that's the price for the high-quality sound. The final advice: adjusting the equalizer, always try to cut, not boost so that sliders stay at 0dB or below. This helps ensure that levels don't exceed the “clipping” point in the digital domain.